She walks on a leash, just like a puppy. Chloe was just "one of the many strays that hang around the neighborhood," according to the person who brought her to Anne Arundel County Animal Control (AACAC) in Millersville, Maryland, this July - but the shelter staff fell absolutely in love with her. Not only was she sweet and friendly at only 9 months old, Chloe was also so pregnant she was almost bursting. 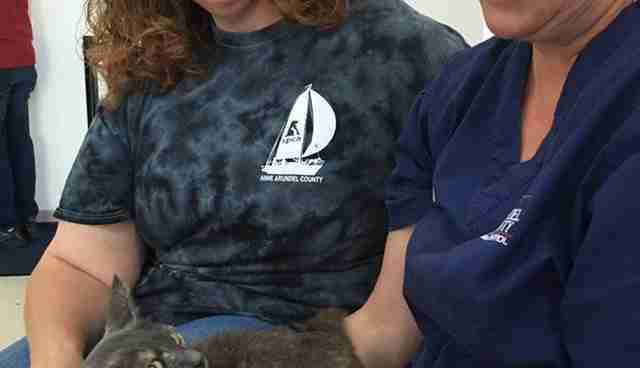 "She is so calm and personality-filled and followed shelter workers around like a puppy," Chris Collins, a volunteer with Friends of the AACAC, the nonprofit created by the shelter's volunteers to help the animals, told The Dodo. Chloe also had another unique, lovable quirk: She loves walking on a leash. "Except, unlike a puppy," Collins said, "she did great on a leash!" 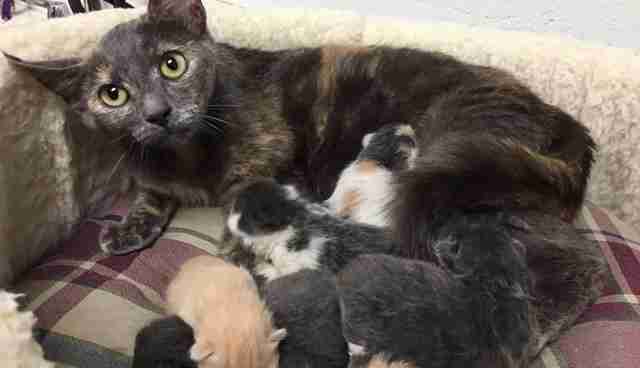 The shelter knew that it had to find the very pregnant Chloe a foster home quickly, because once she gave birth, being at the shelter could be unhealthy for her kittens. 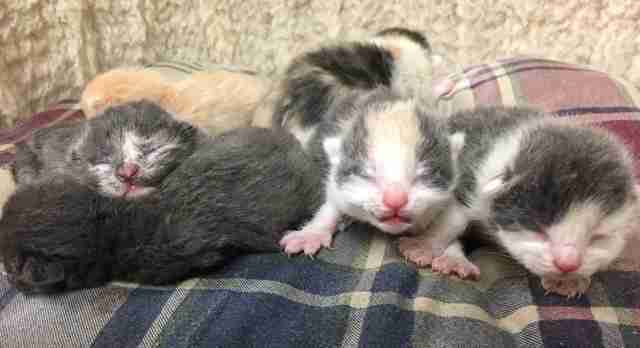 "The shelter tries to get pregnant cats or those with nursing kittens into foster homes as soon as possible to reduce the risk that they will get ill," Collins explained. 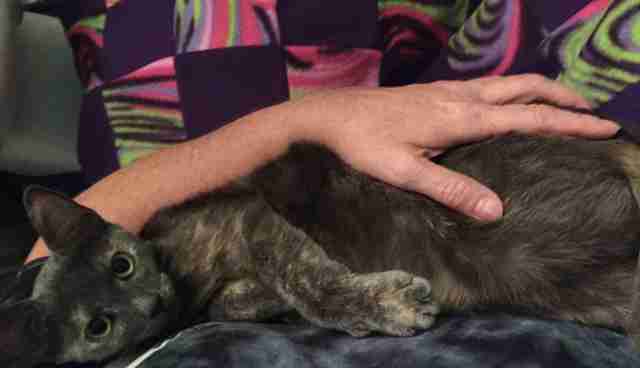 But after Chloe was admitted to the shelter, she had a serious health scare. As is routine for new cats, Chloe was tested for feline leukemia virus (FeLV) and feline immunodeficiency virus (FIV). "To everyone's surprise and dismay, her snap test came up very, very slightly positive for FeLV," Collins said. "Most rescues wouldn't be willing to take her if she was indeed FeLV positive because almost all foster homes have cats of their own." If Chloe was sick, she could get the other cats sick too. The AACAC reached out to its few rescue group partners who do sometimes accept FeLV positive cats, but none of them had room for Chloe - she was running out of time. So the Friends of AACAC took Chloe to get the more sensitive test for FeLV at a local animal hospital. To everyone's relief, Chloe's test results showed that she was actually perfectly healthy. 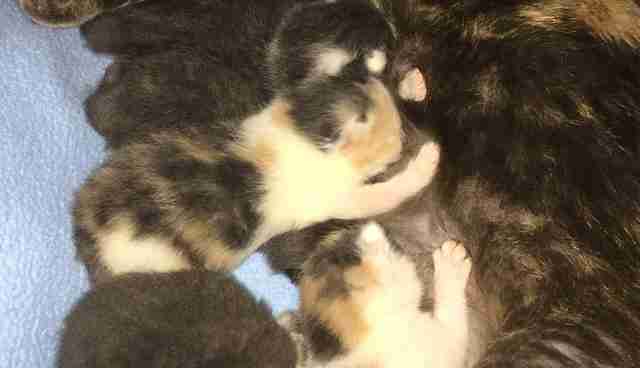 The SPCA of Anne Arundel County offered to take Chloe and her kittens. Late at night on August 9, Chloe gave birth to five healthy kittens. Two days later, she and her family were on the way to live in the home of an experienced SPCA foster mom, Kim Morrissette, who reports that Chloe and her kittens - Catelyn, CeCe, Corbin, Cersei and Candice - are doing very well. "Chloe is such a sweetheart," Morrissette told The Dodo. "She loves people and has the cutest little combination purr/meow. She will let you hold her in your arms like a baby and truly just wants to love on people. She is being a very good momma to her babies as well." Chloe went from a pregnant stray on the streets to safe and sound in a foster home - with a beautiful little family. "Chloe really is a good example of how AACAC and its many rescue group partners work together to save homeless animals," Collins said. When her kittens are a little older (in about eight weeks), both Chloe and the kittens will be available for adoption.